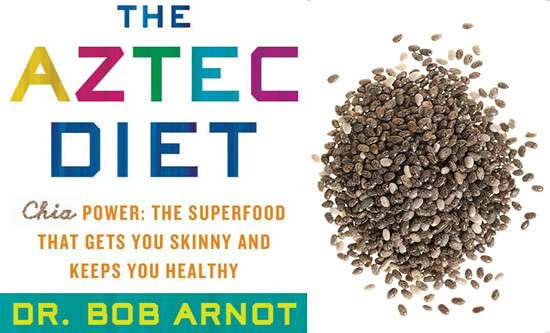 The Aztec Diet was created by Dr. Bob Arnot, a New York Times bestselling author. It is designed to help incorporate the healthy eating habits of the Aztec culture into our modern-day lives. This program focuses on ancient superfoods consumed by Aztec people – in particular chia seeds. The Aztec Diet is a three-phase program that eliminates cravings and teaches you how to make healthy food choices. The eating plan is relatively high in protein and low in carbohydrates – especially refined grains and sugar. The diet of the Aztecs was composed of a variety of nutritious foods. Examples include beans, corn, vegetables, fruit, fish, turkey, amaranth, and quinoa. One of the most important is chia seeds, which serve as the foundation of The Aztec Diet. Chia seeds slow down the absorption of nutrients, which helps to reduce appetite and regulate blood sugar levels after meals. They keep you feeling full for longer because they expand to seven times their size in your stomach. This makes it easier to eat less and lose weight without feeling hungry. The first phase jump-starts weight loss and supercharges your metabolism with three chia smoothies a day. Snacks are permitted in the afternoon and evening. It is like a cleanse because it eliminates everything unhealthy. Yet it provides all the nutrients you need to keep feeling full and energetic. Everyone should do this phase for at least two weeks. However, if you need to lose 20 pounds or more you can stay on it longer. The second phase replaces the mid-day smoothie with nutritious lunch. It is designed to mimic the eating schedule of the Aztecs whose main meal was at mid-day. Consuming a smoothie for the evening meal curbs the tendency for overeating. All of the recipes adhere to the principles of the Aztec diet to keep omega-3 levels are in the target zone. This keeps inflammation under control and ensures you continue to experience the long-term health benefits of the diet. Some of the foods included in the Aztec Diet.Chia seeds, quinoa, amaranth, brown rice, lentils, black beans, salmon, chicken, turkey, egg-whites, feta cheese, almond milk, walnuts, kale, asparagus, corn, broccoli, bok choy, tomatoes, summer squash, avocado, blueberries, strawberries, extra-virgin olive oil, green tea. On the Aztec Diet exercise will no longer be painful or uncomfortable. This is because the diet fuels your muscles so they are ready to power your workouts. You should try to exercise every day, preferably in the afternoon, but the morning is fine too. Start at a slow pace and try to vary the intensity of your workouts. This keeps your metabolism revved up and gives your body time to recover between exercise sessions. The Aztec Diet: Chia Power: The Superfood that Gets You Skinny and Keeps You Healthy retails at $25.99. Also the addition cost of buying chia seeds is expected. They are about $8-$10 a pound. Chia seeds are a good source of omega-3 fats, which have a wide variety of health benefits. Rapid weight loss will probably occur in the first phase, which provides motivation to continue with the program. Offers advice for athletes on how to eat for better exercise performance and recovery. Includes a two-week meal plan and recipes. The first phase is very strict and requires elimination of most solid foods. Some dieters experience bloating and digestive discomfort as their body adapts to a higher intake of fiber from chia seeds. Most of the recipes don’t include chia seeds. The Aztec Diet harnesses the ability of chia seeds to reduce appetite and improve blood sugar balance. These unique properties of chia seeds make it easier to lose weight without experiencing hunger or cravings.